During our whale watching tours we head into the south of the island where we have the best conditions for sightings of marine mammals. 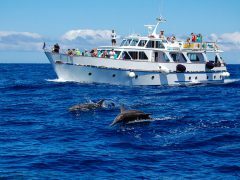 We are lucky enough to be able to say that off the coast of La Gomera during the entire year there is whale and dolphin season. 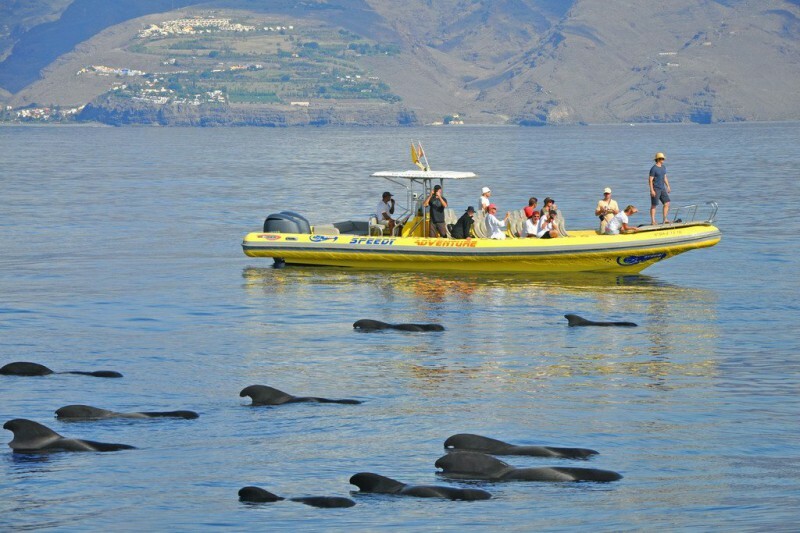 Of all sea areas in Europe, the Canary Islands belong to the best places for successful whale watching excursions. 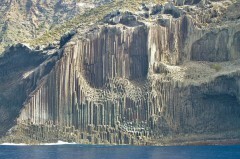 Particularly the area between the islands of La Gomera and Tenerife, because there are so many different species who live here permanently. In addition to those, there are also other species that can be sighted at a certain time of the year during their migration. 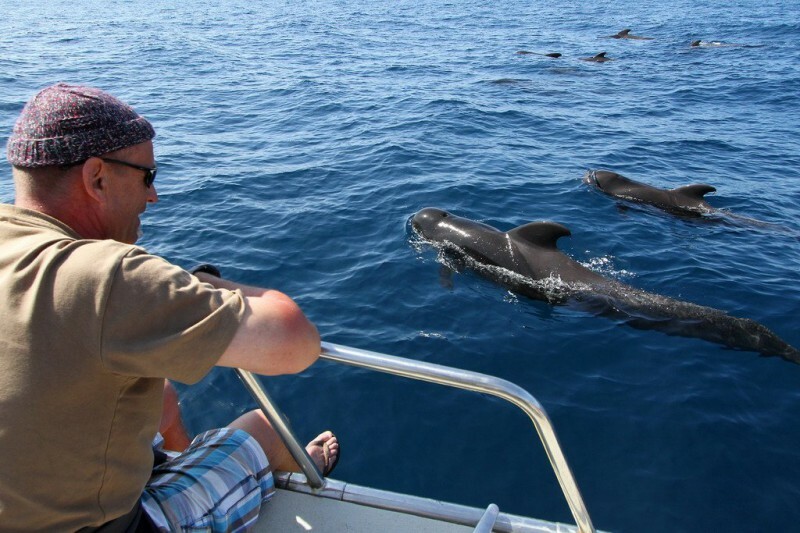 Speedy Adventure offers respectful and sustainable whale and dolphin watching. 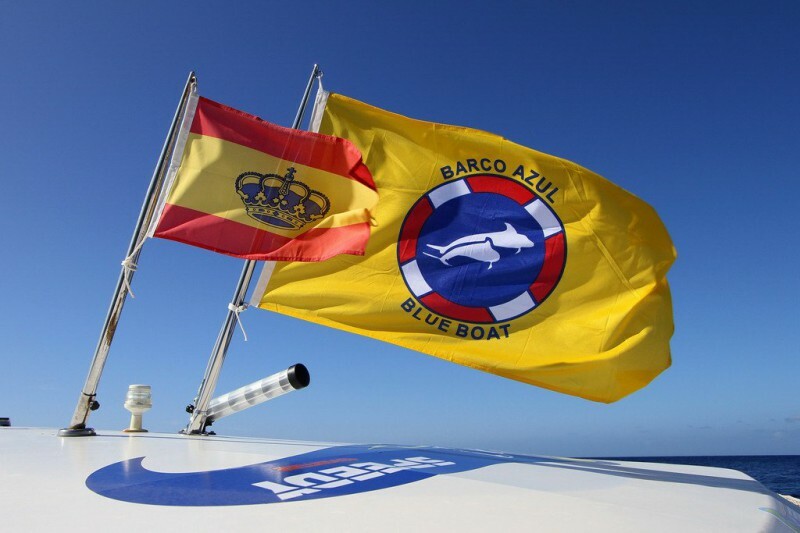 That is what the yellow flag stands for, which is the official award given to us by the Canary Island Government. Also, Speedy Adventure is represented in the European Charter for Sustainable Tourism in Protected Areas. It is our main concern, not to disturb the animals in their natural environment. 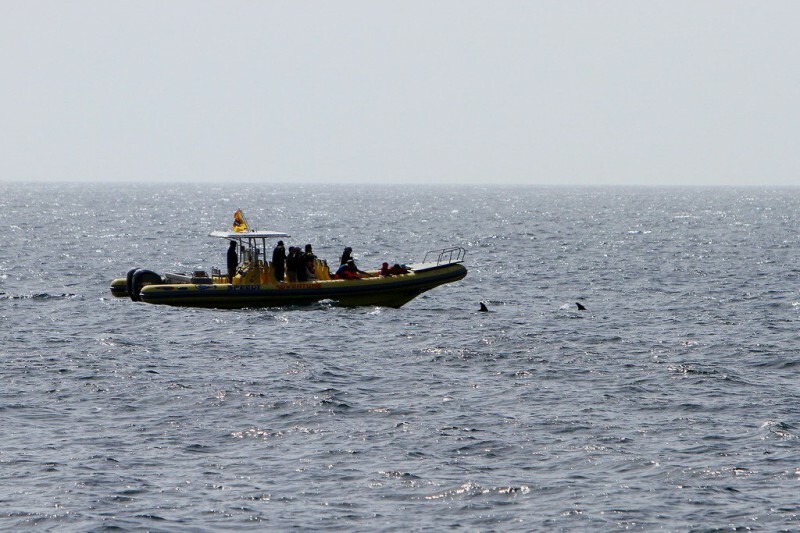 That is why we approach the marine mammals respectfully and keep the required distance to them. Another important point for the ecological whale watching tours that offers Speedy, are the modern engines that work very quietly. These are particularly important because the marine animals are extremely sensitive to sounds and can be easily confused by loud noises. 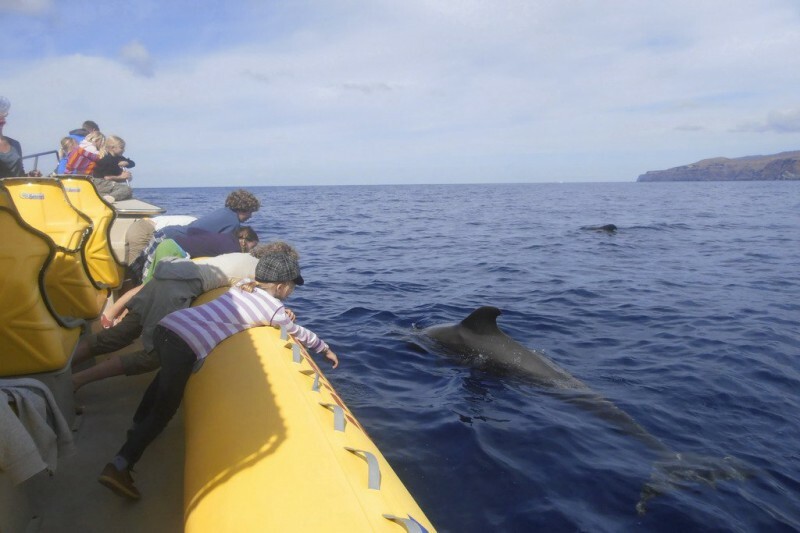 Despite the distance that we keep to the animals, the whale and dolphin experience is very intense, because many species are very curious and they often approach to the boat to explore it. It is not rare to happen that some animals swim in the bow waves of Speedy. 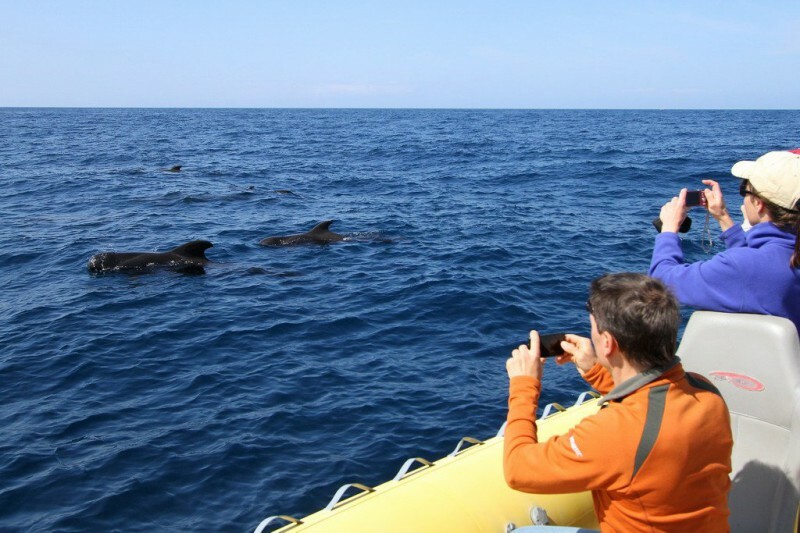 In these moments our guests onboard get very close to them, so to speak, at eye level with the whales and dolphins. During our whale watching trips we usually go out about two to three nautical miles where we almost always see dolphins at first. 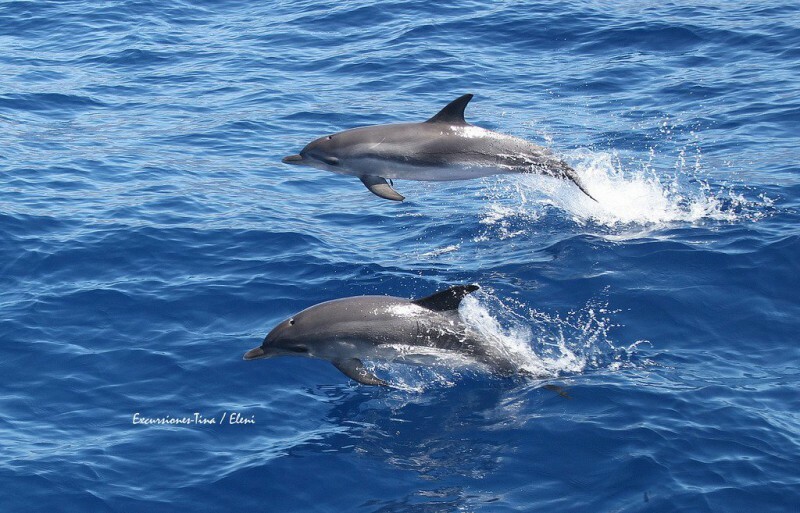 Mostly the Bottlenose dolphins and the Atlantic Spotted dolphins are our first companions. 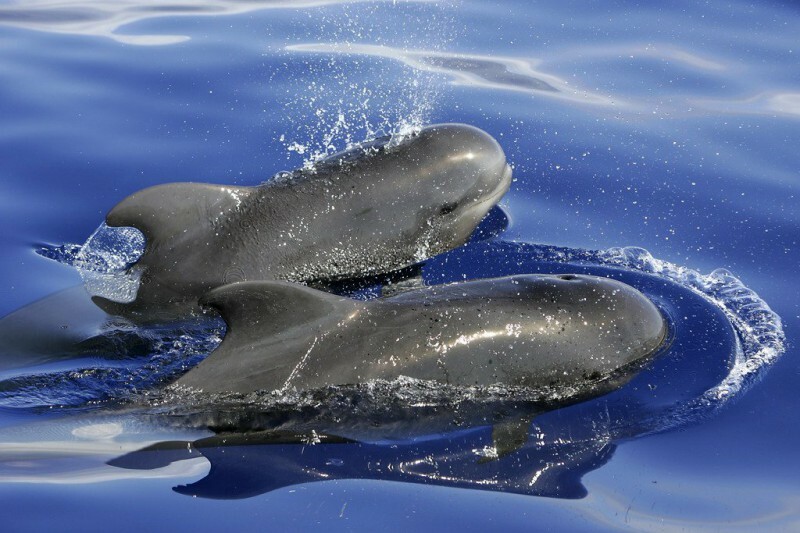 These and other dolphin species live permanently in the area between La Gomera, El Hierro and Tenerife. 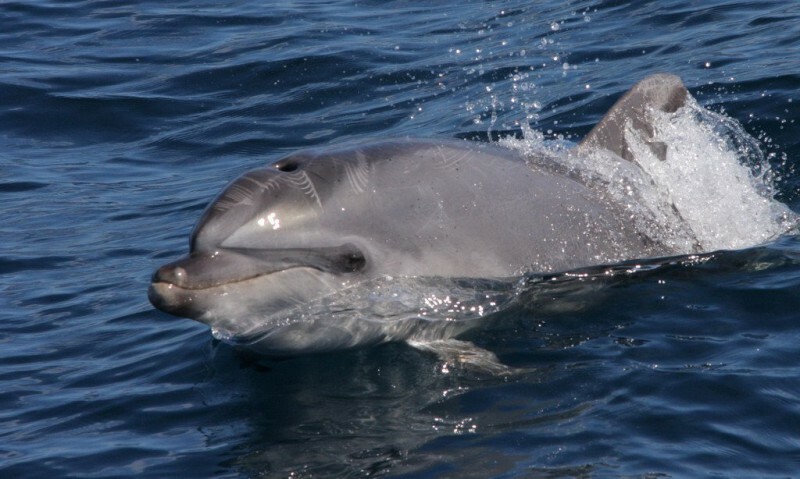 Very often all over the year, we sight these marine mammals. More species permanently living in this area of the Atlantic, are the Short finned pilot whales. They live here in the world’s largest known, cohabiting population. These quiet sea creatures we can meet here also throughout the entire year, mostly in groups. Since these animals hunt at night, they use the daytime to rest. 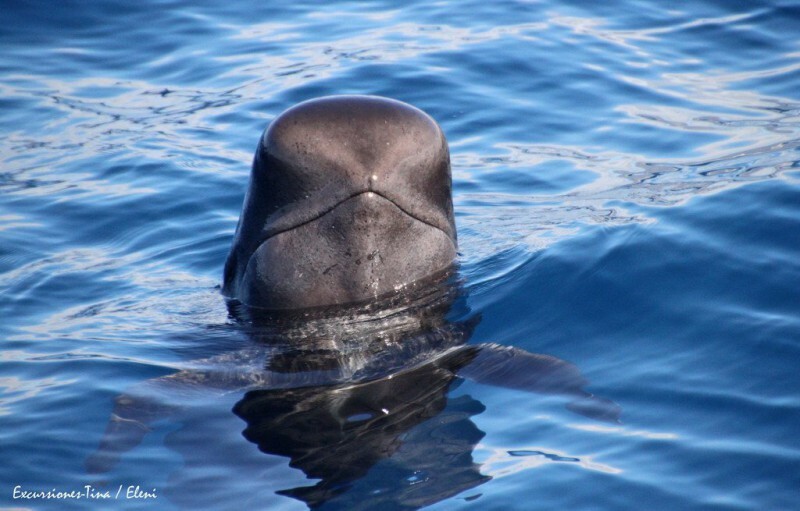 Therefore, during the whale watching trips, usually we see many pilot whales together as they drift completely relaxed on the water surface. 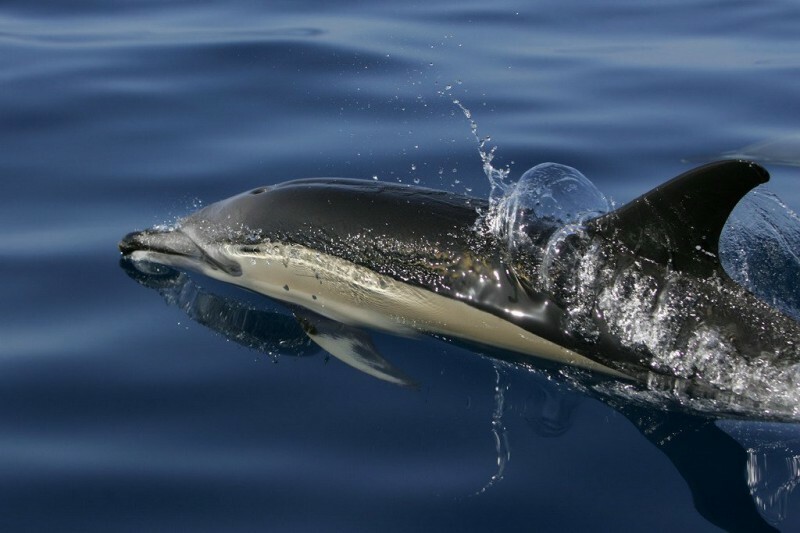 Around 30 different whales and dolphins have been sighted off the coast of La Gomera in the Atlantic Ocean in the last years – the most common of these are the Bottlenose dolphins, Atlantic spotted dolphins, Striped dolphins, Common dolphins, Rough-toothed dolphins, Pilot whales, Bryde’s whales and Sperm whales. After the dolphin and whale watching, we head back to the coast, where we make a stop in the bay La Cantera which is located below the village Alajeró. Here we offer our guests our homemade sangria with fresh fruit. 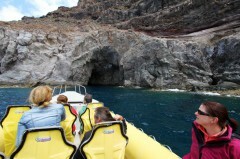 Guests may also swim here and experience the animals of the shallower water while snorkeling. Those who do not feel like swimming can also simply enjoy the atmosphere of the quiet bay. Although the old fish factory is now in ruins, you still et a good impression of how important the fishing industry used to be here for the people and the economy of La Gomera. Several tons of fish, especially tuna and mackerel, were processed here between 1891 and the 70’s of the 20th century. Together with the cannery factory, which was located in the nearby bay La Rajita, a big part of La Gomeras’ former economy was generated here. After the swimming break we go back to Valle Gran Rey along the coast. Since the Speedy boat can approach very close to the coast, the guests aboard enjoy a close look to the rocks and cliffs of the south coast of La Gomera. Also because the Speedy has no draught it can enter a big cave which is located on this route. 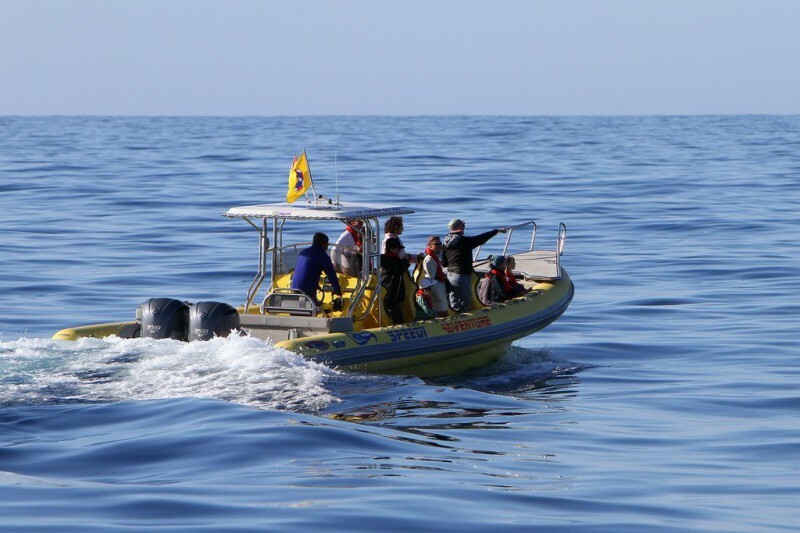 Altogether, our whale watching tours with Speedy Adventure take about 3 hours. 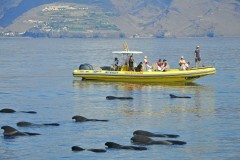 All Whale Watching tours depart in Vueltas, in the port of Valle Gran Rey. On demand also tours for groups from Playa Santiago available. Depending on the demand another tour at 2.00 pm! 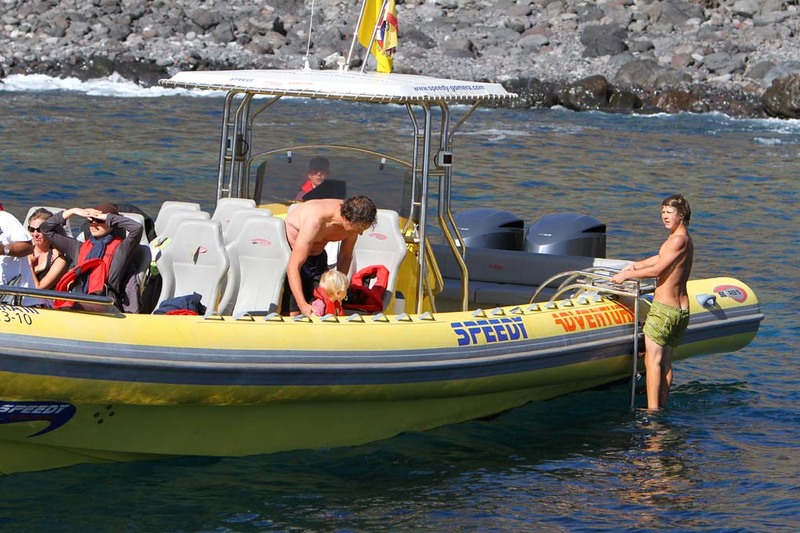 Book your Speedy-Ticket directly in our office in the port of Valle Gran Rey. Angela, Tine and Antje will be there to tell you all about Speedy, Whale Watching and Los Organos. 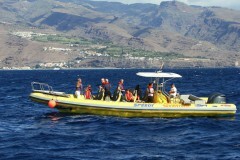 The sustainable Dolphin and Whale watching is the special concern of the team of Speedy in La Gomera.